This page has limited information. 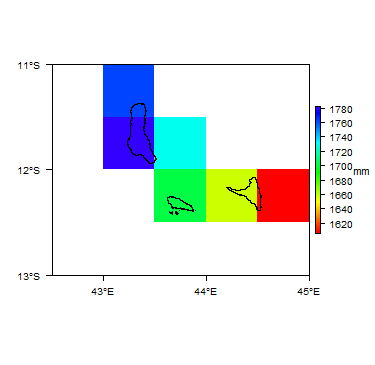 If you have more recent information on the hydrogeology of Comoros, please get in touch! Comoros is an archipelago nation of three major and numerous smaller volcanic islands islands off the east coast of Africa. Comoros and France dispute ownership of a fourth major island, Mayotte. The population is ethnically diverse as a result of centuries of immigration by Indonesian, Bantu African and Arabic peoples, among others. In the first centuries of the second millennium AD, the islands were an important trade hub and stopover between Arabia and Africa. The pre-colonial economy was dominated by slave trading, which continued after France colonised Comoros in 1841, with the addition of plantation agriculture. Since independence from France in 1975 there have been multiple coups and widespread conflict. The island of Mayotte voted against independence in 1974 and 1976 by a large majority. The islands of Ndzuani and Mwali tried to become independent from the largest island of Ngazidja in 1997, since when they have experienced more autonomy, with each island having its own president within the overall union of the three islands. The long term political, civil and military unrest means that development remains rudimentary, and Comoros i s one of the world’s poorest countries. The economy of Comoros is dominated by agriculture, also including fishing, hunting and forestry, which contributes 40% of GDP and employs 80% of the labour force. Spices and the marine industry provide important export income, and the country is heavily dependent on external aid. The country is densely populated, although mostly rural. 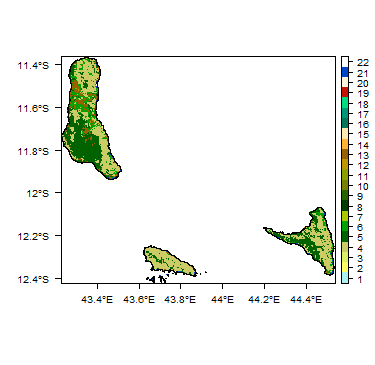 Comoros has relatively high rainfall, although it is not evenly distributed seasonally. There are few rivers, and much of the population relies for water supplies on rainwater harvesting, stored in tanks and cisterns. These were traditionally uncovered, and many were contaminated by ash deposition after a volcanic eruption in 2006. Recent development activities have focussed on covering private water supply cisterns and raising awareness about protecting water resources from contamination. The largest islands of the Comoros archipelago are Ngazidja (Grande Comore), Ndzuani (Anjouan) and Mwali (Mohéli). Moroni, the capital, is on Ngazidja, the largest and westernmost island. The neighbouring island of Mayotte is under French administration. Border countries none - Indian Ocean. Nearby countries are Mozambique, Madagascar, Tanzania and the Seychelles. Surface-water resources are largely sufficient on Ndzuani and Mwali (United Nations 1989). On Ngazidja, in contrast, the island's relief; the dense concentration of its population in the coastal strip; and the lack of suitable sites for dams leads to water supply problems, and this island has been subject to much hydrogeological study. More information is available in the report UN (1988) (see References section, below). The Comoros are volcanic basalt islands, the tips of a submerged range. There are at least three main phases of volcanic activity, separated by phases of rest and alteration. 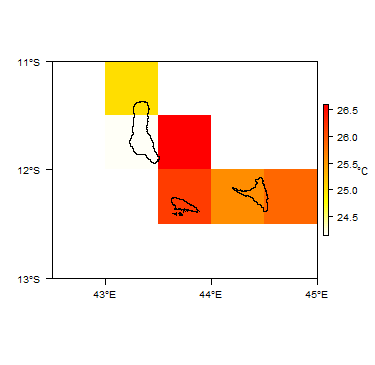 Almost the whole of Ngazidja island is covered with ouctrops of volcanic materials of the most recent upper phase, surrounded by lavas of the intermediate phase. At the ground surface there are also layers of red clay several metres thick, indicating advanced laterisation of the early phases (United Nations 1989). The lavas of the later phase are compact or finely vesicular grey-black or iron-grey rocks, especially andesitic basalts, labradoric basalts, basanitoids and limburgites. The lavas of the intermediate phase are of a very common type; their mineralogical differentiation from the lavas of the upper phase is not always very clear. Scoria are often also found at the base of a flow; the middle part of a flow is more compact but fissured. The lava are sometimes extremely vesicular, as a result of cooling in the open air (United Nations 1989). Small outcrops of alluvium, the result of sporadic surface water flows, are found in the form of fine materials produced by the recapture of pyroclastic materials or very coarse materials shaped by the action of torrents (United Nations 1989). 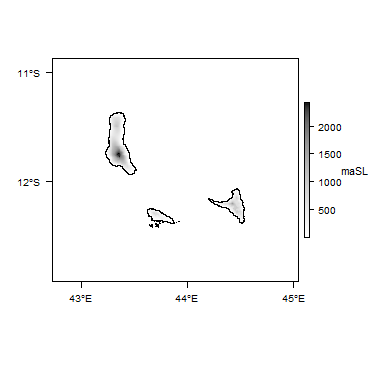 More information on the hydrogeology of Comoros is available in the report UN (1988) (see References section, below). The basaltic lavas have high permeability. Other formations are thought to be of little hydrogeological interest. Direct rainfall recharge is likely to be rapid and high, infiltrating down to the aquifer base roughly at sea level (United Nations 1989). The degree of alteration of the volcanic rocks, and therefore their permeability, is in direct proportion to their age, and so the infiltration of groundwater water is likely to be influenced by the spatial distribution of the ancient volcanic materials - i.e., the paleo-relief. Groundwater flows tend to be concent1ated in the ancient valleys, occupied by recent flows which are more permeable than the surrounding older rocks, and thus forming preferred groundwater flow paths. Local disruptions to groundwater flow may create perched aquifers - such as vertical dykes and the alteration of ancient basalts at depth (United Nations 1989). There are a number of springs, both ephemeral and perennial, on Ngazidja island, mostly with a low yield. Some examples are M'Koudoussi, Hamoindze and Souou, which are perennial with yields varying from 0.5 m³/h in the dry season~to 50 m³/h in the rainy season. Other examples, such as N'Gnambéni and M'Rotso in the massif of Badjini, and Bonde in the massif of La Grille, have yields that vary from 1.5 and 2.5 m³/h in the dry season to 30 to over 100 m³/h in the rainy season. Along the coast, there are a few discharges of brackish water which flow at low tide. 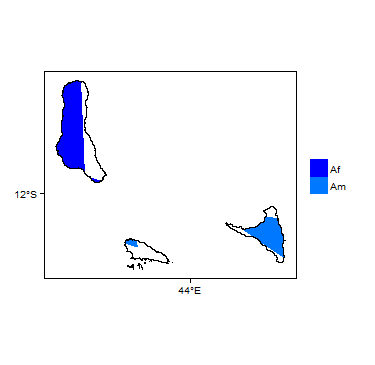 Infiltrating rainwater has a very low mineral content, in the order of 100 mg/l, with a Cl content of 10 to 20 mg/l, and mainly of Ca-Mg-HCO3 type when measured in the island's interior springs. 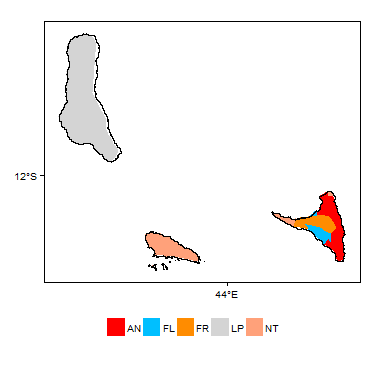 Na and Cl are prevalent in all the water tapped in the coastal zone, owing to the influence of sea water, even in the water with lowest mineral content. The groundwater of the coastal zones can therefore be considered essentially diluted sea water, the mineral content of which is determined by the degree of sea water intrusion (United Nations 1989). References with more information on the geology and hydrogeology of Comoros can be accessed through the Africa Groundwater Literature Archive. United Nations. 1989. Groundwater in Eastern, Central and Southern Africa: Comoros. United Nations Department of Technical Cooperation for Development.